It’s crept up on me this year. Here I was still thinking it’s October, but suddenly it’s December. Time to start preparing gifts and thinking about the Christmas table, though my mind is elsewhere as I’m really trying to plan my baby’s first birthday! I knew having a Christmas baby would make the holidays different and I have this feeling that from now on my Christmasses are always going to creep up on me and the birthday will take pride of place. 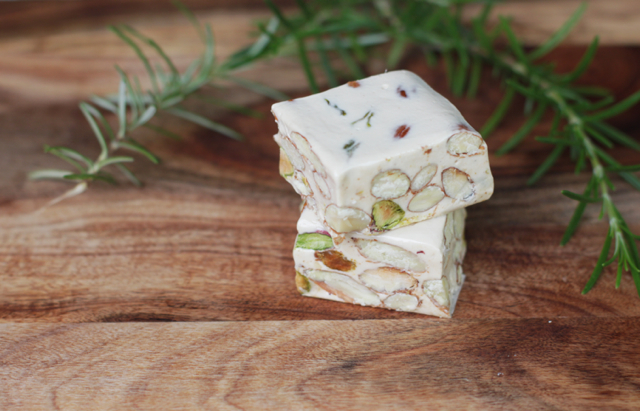 So to get in the mood and at the same time prepare some homemade gifts, I’m tackling a recipe that I’ve always wanted to make – torrone, or Italian nougat. A candy that is synonymous with festivity, it’s the perfect thing to take to friends’ homes and share with an espresso as a sweet snack or with dessert wine at the end of a meal. 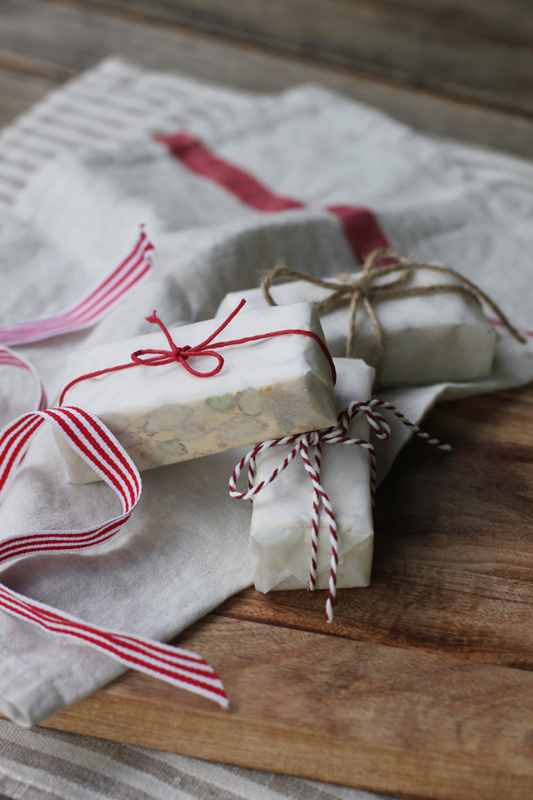 I do love preparing my own homemade gifts, especially when they are food related and can be prepared in advance. I think my best gifts have been these kind of gifts. One year when I was particularly broke, I managed to create little hampers to give to all our friends and family with things like handmade spiced jams, biscotti, flavoured salts and relishes. It didn’t cost much, but it was all made with love and the baskets looked rich and overflowing. The reaction was overwhelming, everyone loved them. 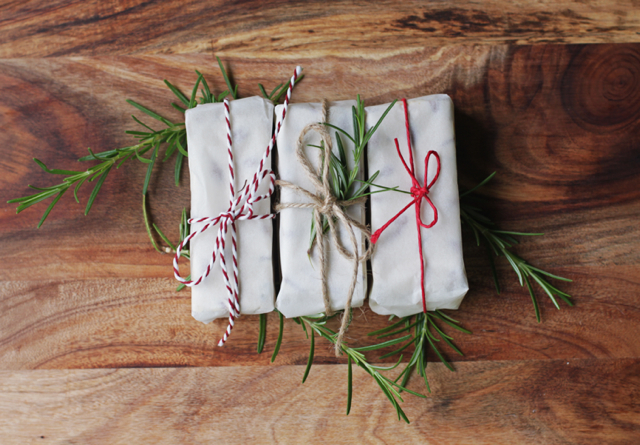 Homemade gifts are so much more personal and I find that everyone loves food, so even those tricky people who you never know what to get are happy. It’s the theme of this month’s Italian Table Talk, a discussion of true Italian cuisine, rituals and traditions, as Giulia prepares some delicious calzoncelli, traditional almond cookies from Melfi in Basilicata, Jasmine makes gelatine and Valeria makes sesame brittle (cubbaita di giuggiulena). You’ll have no shortage of ideas after this! I may have set my sights a little too high with the torrone, though. I thought it sounded simple enough. I had my new candy thermometer, I had extra help in the kitchen (at one point I needed at least four hands, one set to hold and stir the meringue while the other set poured dangerously bubbling hot sugar syrup into the meringue) and I’d even timed it all to be done while the baby was napping (otherwise I would have then needed six hands!). But the first and second attempts – the first a fig and pistachio number, the second a chocolate and candied orange one – were flops. The torrone hadn’t set. It was a sloppy, floppy, sticky, delicious mess. So, back to basics it was. When it comes to daunting recipes there’s nothing wrong with a bit of simplifying and going back to look at historic and traditional ways – contrary to what some may think, not all modern ways are the easiest! 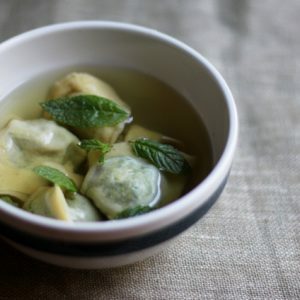 I noticed when researching traditional recipes for torrone in Italian, starting with Ada Boni’s 1921 cookbook, The Talisman, there were never any indications of temperature, thermometers and such – just old fashioned instructions for stirring for hours and testing for doneness with a drop of the molten candy in a glass of water. Surely this age old ancient Roman candy could be made without all this fuss. Then I came across Sardinian torrone. No syrup, no sugar. Just three ingredients stirred together over gentle heat. I’m drawn to it because of its simplicity – as soon as a nougat or torrone recipe asks for glucose, corn syrup, powders, butter or cocoa butter, I’m gone. Torrone has a long tradition in various regions all over Italy, each done a little differently. The one from Cremona, also known as torrone classico,is probably the most famous. It’s brittle and hard, and has to be chipped off in chunks to be eaten. Abruzzo’s Aquila has chocolate torrone. Buttorrone sardo, which comes from Tonara in central Sardinia, in its most elemental form is made with just egg whites, almonds and honey. 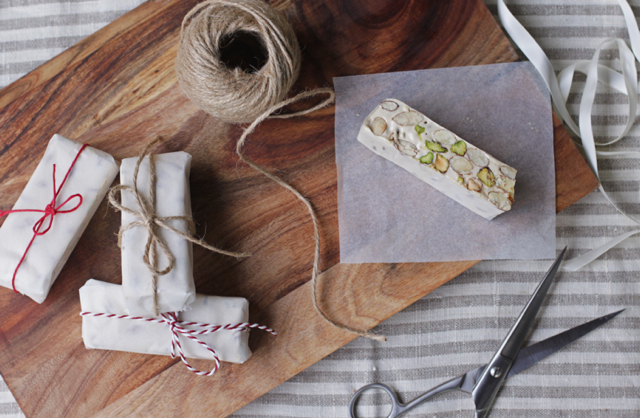 It’s a wonderful soft nougat with an ivory hue, speckled with nuts. There are two main ways to make this traditional Sardinian torrone. The first is to place the honey and unbeaten (or lightly beaten) egg whites in a pan then gently heat while stirring continuously with a wooden spoon for 45 minutes. Nuts are then added and mixed for a further 30 minutes. The second way differs only in that the whites are whisked to peaks first, then added to honey melted in a bain marie. Then stirring, adding nuts, stirring. It’s a simple, even relaxing recipe. No watching of thermometers, no scalding syrup or defining moments. Just a gentle heat and slow, continuous stirring. Put on some good music, or better yet, have some good company in the kitchen with you so you can share the stirring and you’re halfway there. The most traditional recipe uses just almonds and Sardinian honey, which is gathered from the Mediterranean scrub that surrounds the island. But a portion of pine nuts wouldn’t go amiss. I used pistachio for a touch of colour. Hazelnuts would also be nice. You can peel your almonds, but I like the contrast of the skins on, either way, an even toasting in the oven of the nuts is a must to bring out the flavour. If you wanted to add some further aromatics to the batch, try some grated fresh orange or lemon peel or a freshly scraped vanilla bean pod. Like all really good things, keep it simple. Typically, any torrone is set between two special wafers known as ostia in Italian. If you can’t get these easily, line your pan with parchment or baking paper – just remember to peel it off before eating it! 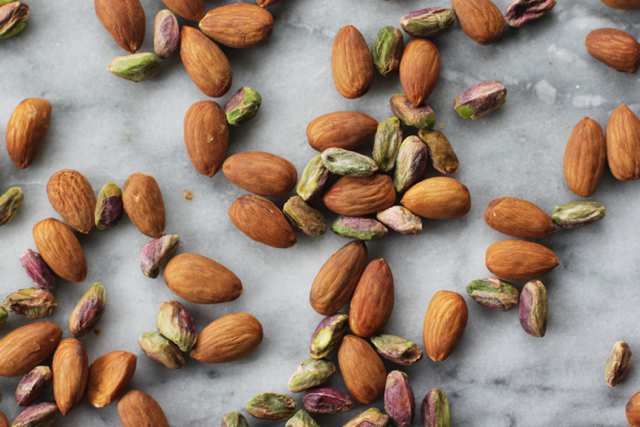 For the nuts, it’s traditional to use 100% whole peeled almonds, but you could do a mix, substituting a portion of almonds for other nuts or even dried fruit such as figs. Place the nuts on a single layer in a baking tray and toast in oven at 325º F, about 10-15 minutes or until shiny and fragrant. Set aside. In the meantime, whisk egg whites to stiff peaks in a separate bowl. Add the whites to the bowl of honey which is still over the bain marie, stirring with the wooden spoon to incorporate. It should turn into a caramel-coloured cream. 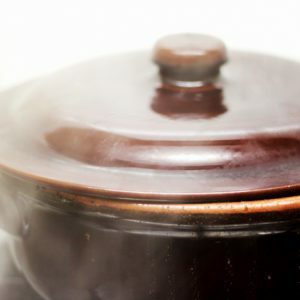 Keep cooking, stirring slowly but continuously over gentle heat for 45 minutes. The mixture should thicken and become paler. A small test should determine that your torrone is at a good stage – a drop of the mixture in a glass of water should solifidy into a soft ball, not dissolve immediately. Add the nuts to the mixture and continue cooking and stirring for 30 minutes. Pour into your prepared baking tin. Fold over the parchment to cover the top and smooth it down, pressing the torrone gently with your hands. If using the more traditional ostia, place a layer of ostia cut to size on top and press gently but firmly. Place in a cool place to set for a couple of hours. When set, cut the torrone into thick slices with a sharp, heavy knife (a little olive oil wiped onto the knife helps). 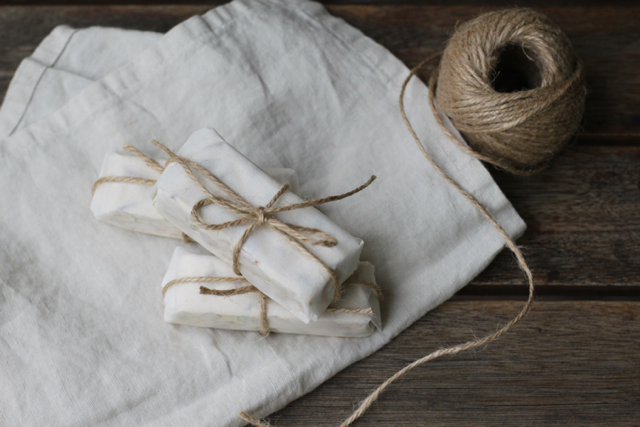 Wrap in parchment or cellophane and tie with pretty string or ribbon for the perfect homemade holiday gift. Keeps very well wrapped in parchment or cellophane and stored somewhere cool. 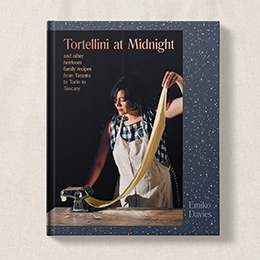 Part of this article appeared on my Regional Italian Food column over at Food52. A great idea! I’ll be making those soon. I especially like the fact that your torrone is glucose syrup-free. Yes, that’s what attracted me to this traditional recipe in the first place! I was so put off all the recipes I saw that asked for liquid glucose, corn syrup or even cocoa butter! 3 simple ingredients is all you need! Perfection on a Noël plate!….Do you suggest any particular types of honey?..There are wonderfully few ingredients…but I image that with this…the selection of them is quite important!! …Also…did you “finish” them with an edible wrap(paper)?…Is it difficult to obtain? Is it called “wafer”? Writing to you from France! Thank you for this beautiful recipe!! Thank you! 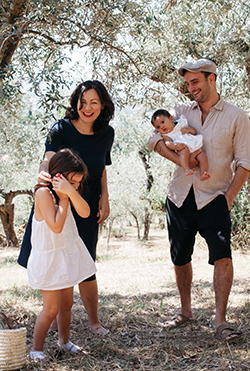 The traditional recipe uses of course Sardinian honey gathered from wild shrubs that grow along the coast. I’d suggest honey from wild herbs as the closest. Or failing that, any nice flavoured, fairly light-caramel coloured honey, perhaps more delicate than strong. In this case I didn’t use the edible paper. 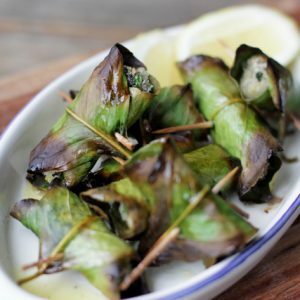 The traditional one is called ostia, but if you can’t find it you could try rice paper. I’m sure being so close to Italy that ostia is available somewhere. You can usually find it in specialty Italian stores or online – I think even amazon sells it! Jesse and I got married on 23rd December so, like you, Christmas has a whole different meaning for us now, and I love it so. It makes it somehow more personal, intimate, less commercial and imposed. Keep it simple – that’s the mantra. Recipe: amazing, bookmarked. Yes, yes, yes. I won’t even begin thinking about christmas until after the birthday now! So that leaves, um, very little time for Christmas planning! Keep it simple indeed! The Torrone Sardo look so pretty! It’s funny, I’ve had similar problems with modern recipes being a total disaster. I sometimes wonder if all the instructions, temperature monitoring and details take the focus away from how things look, feel and smell– the indicators our grandmothers used. Going back to basics with the simple way is usually the trick! What size baking dish do you recommend for this recipe? I used a 7×8 inch pan (an 8×8 would also work). Ah yes, my first child is a Christmas baby and it just gets busier every year. Especially when you have a second child who still needs to feel all the excitement of Christmas without his sister overshadowing him, which happens enough as is when kids have older siblings. This weekend I am hosting an early sleepover birthday party for my girl and also have cookie baking to do for the school Christmas fundraiser. I decided to unite the two and make it a party activity. The girls get to decorate and bring home their decorated cookies as party favors and the extras will be brought to school to sell. I hope your baby has a wonderful first birthday: as tough as it is, a Christmas birthday is also unique and wonderful (if you manage to keep it a separate celebration, that is). Good luck! Oh dear, I hadn’t even thought about how siblings are affected by the Christmas birthday! we have a couple days in between – just enough to start thinking about Christmas after the birthday! It’ll be much simpler than it ever was before I think! Oh this looks amazing! 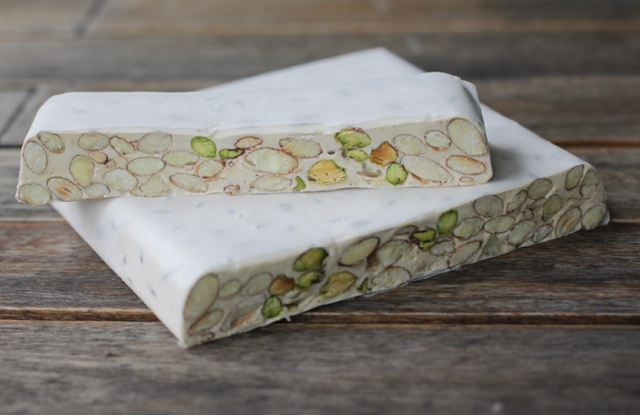 I love nougat but it is so very hard to find decent one – one that isn’t creating a sugar coma after you’ve had a bite. It can be so creamy but it can also hit you on the head if there is a bucket of sugar involved. So right! 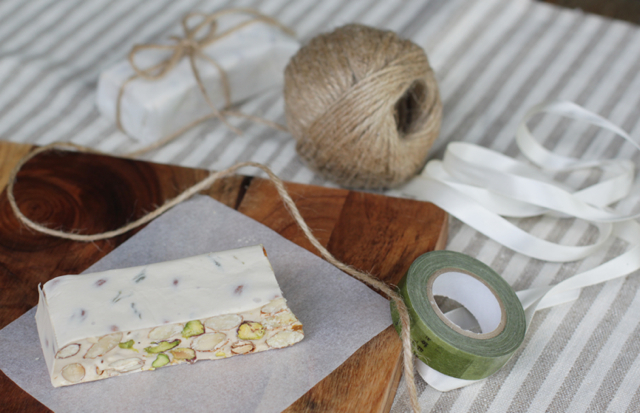 If you’ve ever had really bad nougat, it’s hard to even want to try others, let alone go to the effort of trying to make it yourself at home! But homemade with simple, good ingredients, I must say, is like nothing else! If only I was confident that it travelled well, I’d send you a batch! an attempt to draw a closer connection the land that they instinctively knew sustained them. Offering a variety of specialty produce alongside strong selling products establishes a foundation of success with any business and this includes a fruit-stand or Farmer’s Market enterprise. I love how simply it sounds, and yes, how relaxing it must be, like chatting over a cup of tea. I never dared making torrone, but reading your post I was browsing in my cupboard to see if I have nuts left to give it a try. It inspires, simple things are the best, especially when they are made with love and care. I love nougat. Used to buy it for my grandpa every year at Christmas. Will definitely give this a go. And those horror stories are justified! Had a few complete disasters while trying to find the right torrone recipe. This is just so wonderful in its simplicity! I have now tried making this twice and have failed both times. I’m not sure if my egg whites didn’t peak enough, or the fact that it was extremely hard to incorporate the honey into the egg whites. I used a double boiler, could that have been the issue? Do you have any other pics of this process? Thanks, I’d appreciate any advice, I’d really like to master this recipe! Hi Ange, thanks for your comment, so sorry you’re having trouble. 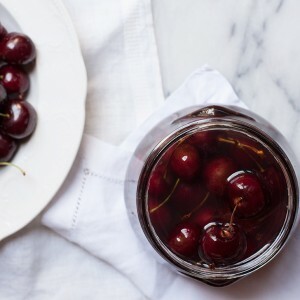 I’ve posted this also on Food52 and there is quite a lot of useful feedback in the comments there that might be able to help. The part that seems strange to me is that you had trouble incorporating the honey into the whites. The double broiler is part of the recipe, so that’s fine, but the honey should be completely melted and totally liquid. When you add the stiff whites (to check if they are stiff enough, tip the bowl upside down – yes! but carefully! – when properly stiff they won’t move or fall out at all! A good party trick!). When you add the whites to the melted honey, they will deflate a bit but become really creamy. Was your different to this? So does this recipe give a soft nougat or a crispy hard one.? This is a soft nougat. Could you please tell me how sweet the end product is? We just visited Maria Grammatico in Erice and her torrone was soft and not too sweet, which made it so fantastic and delicious. Your recipe looks amazing and I thought I would inquire about the sweetness. It really depends on the honey you use — So it’s not overly sweet like candy made of pure sugar but it IS as sweet as the honey you put in it! Hope that helps! Had torrone sardo for the first time lately and I loved this. Simple, softer than what I’m normally served. Thank you for the recipe. This came out fantastic! Where do you store the end product? Is room temperature (like a kitchen cupboard) acceptable? Last year I followed your recipe exactly and the torrone came out perfectly. This year, following the recipe again, I had a problem when I added the almonds (after 45 mins of slow stirring and testing the torrone to see if it formed a soft ball in water). The mixure became hard quickly but I continued stirring for the required 30 minutes and the result was NOT lovely and soft like last year. What happened? This recipe looks wonderful, and it will be neat to make it the old-fashioned way, without stand mixers and candy thermometers and corn syrup! Is it possible to make your own ostia? Just out of curiosity for what was the real, old, traditional coating. These days I can buy imported, factory-made rice wafer from a confectionery supply shop. But what did the ancient Sardinians use? That’s a very good question that I don’t have a factual answer to at the moment! There must have been something, perhaps linen I’m suspecting!